Not All Those Who Wander Are Lost: Lack of bookshelves ? In a house of many books there is always, and no doubt will always be, a lack of bookshelves. What did I do? Well, I started thinking outside the box and looked around for possible places to put books. Here are two spaces that I found. 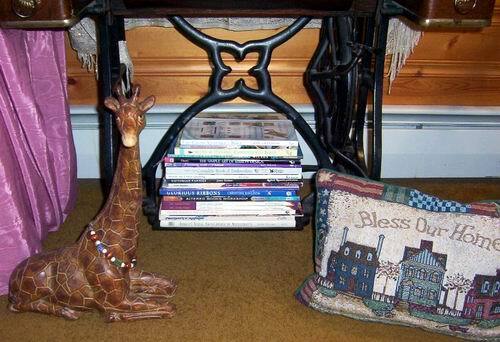 In the little corner by the chimney and the brickwork are some of my craft books, protected from any heat from the chimney by a little metal stove, and supported on the other by a rock painted with an African scene by artist daughter, Heather. The large pedal ( is that the correct word for that part of an old treadle sewing machine? ) was just the right size for holding another pile of craft books. Mind if I snitch your idea?...I have an empty treadle that just may have to become a bookshelf! Of course not Cyndy. Go ahead! It's a usable space that normally is vacant 99.9% of the time right?! when i was packing for the big move, i started sorting my books ... now my books are like my babies - BUT i do want others to READ them too ... soooo, i divied them up to family/friends/library .. now i have about 40% less books ... but no house to put them in yet! the search continues! There are books everywhere here, too, but not as creatively situated. Great ideas! Glad you liked the ideas Leslie.